Ok, this is not amazing but it is useful for you joystick/gamepad users and multi-taskers. This script is written in autohotkey and borrows some code from RocketLauncher. To use it Open HyperHQ, Go to Main Settings -> Startup\Exit -> and set the .exe file as your startup program. Run it once, a new file should appear in the folder it is in. It's name will be the same name as this program and will have the extension "ini"
Open the ini file. You should see some of the settings described below. HyperSpin_Folder_Path REQUIRED! is the path to the folder containing hyperspin.exe (Default is .\ which would be the same folder as the startup script. ..\ means one folder up. ..\..\ would mean two folders up). Absolute paths are still accepted. Primary_Color_RRGGBB is the background color of the menus given in a hex rrggbb format. Examples and a color picker can be found here. Secondary_Color_RRGGBB is the background color of the menus given in a hex rrggbb format. Examples and a color picker can be found here. Joysticks_Enabled can be true or false. Set this to true to use a joystick or gamepad with hyperspin. May work for controllers other than the 360 controller. Joystick_Deadzone is a number between 0 and 49 representing the size of the axis deadzone for every axis. 0 is the most sensitive. 49 is the least sensitive. Joystick_Up, Joystick_Down, Joystick_SkipUp, Joystick_SkipDown, Joystick_SkipUpNumber, Joystick_SkipDownNumber, Joystick_HyperSpin, Joystick_Genre, Joystick_Favorites, Joystick_Start and Joystick_Exit do the same thing as their HyperSpin keyboard counterparts. 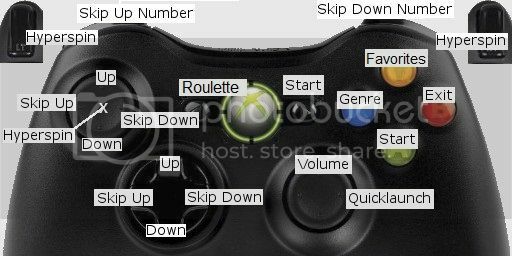 Joystick_Roulette, Joystick_Volume, Joystick_Volume_Close, Joystick_QuickLaunch and Joystick_QuickLaunch_Close joystick controls for roulette, volume bar and quicklaunch bar. Joystick_Info, Joystick_Info_Close, Joystick_Filters and Joystick_Filters_Close are not yet implemented, need to be able to receive Event Dispatcher info, com xml code are needed to get these controls to work. Minimize_Background_Windows_Enabled can be true or false. Set this to true to minimize windows when this script starts. Window_Classes_To_Not_Minimize is a comma delimited list of window classes that will not be minimized. To get the window class you can use this tool AU3 Window Spy.zip. Program_To_Run_Target_1 is a document, URL, executable file (.exe, .com, .bat, etc. ), shortcut (.lnk), or system verb to launch. If Target is a local file and no path was specified with it, The script's directory will be searched first. If no matching file is found there, the system will search for and launch the file if it is integrated ("known"), e.g. by being contained in one of the PATH folders. To pass parameters, add them immediately after the program or document name. If a parameter contains spaces, it is safest to enclose it in double quotes (even though it may work without them in some cases). Paths relative to the startup script are allowed. Program_To_Run_Working_Dir_1 is the working directory for the launched item. Do not enclose the name in double quotes even if it contains spaces. If omitted, the script's own working directory will be used. Relative Paths are not allowed. Note: Some applications (e.g. Calc.exe) do not obey the requested startup state and thus Max/Min/Hide will have no effect. To add more programs to open, just change the 1 to a 2 for the second program, the 2 to a 3 for a third program, etc. Roulette_Key is the compatible autohotkey key name for the key or two key combo used to trigger the roulette event. Modifier Symbols are accepted. There is already built in support for the roulette function for joysticks. Volume_Menu_Key is the compatible autohotkey key name for the key or two key combo used to open/close the volume bar. Modifier Symbols are accepted. There is already built in support for the volume menu for joysticks. Volume_Bar_Offset_From_Bottom is the distance in pixels from the bottom of the screen to the bottom of the volume bar. For reference the windows 7 taskbar is typically 40 pixels. QuickLaunch_Key is the compatible autohotkey key name for the key or two key combo used to open/close the quicklaunch menu. Modifier Symbols are accepted. There is already built in support for the quicklaunch menu for joysticks. QuickLaunch_Enabled can be true or false. Set to false to disable the use of the quicklaunch menu, useful to disable if you don't want to ruin the arcade experience, useful to enable to help troubleshoot and make changes to your setup, amongst other things. Item_1_Path is a document file, executable file (.exe, .com, .bat, etc. ), or shortcut file (.lnk), to launch. If Target is a local file and no path was specified with it, The script's directory will be searched first. If no matching file is found there, it will not be added to the menu as an option. Paths relative to the startup script are allowed. Item_1_Parameters is the parameters to pass to the application. If a parameter contains spaces, it is safest to enclose it in double quotes (even though it may work without them in some cases). Item_1_LogoPath is a path to an image file to be used as the logo for the application in the quicklaunch menu. If this value does not exist or is empty, this script will attempt to extract and use the application's icon. Item_1_Ignore_Process_Close can be true or false. does not reactivate hyperspin or the quicklaunch menu when the application specified is closed. Useful for for applications that use a launcher. To add more items to the quicklaunch menu, just change the 1 to a 2 for the second item, the 2 to a 3 for a third item, etc. If you want the source ahk code for the latest version just pm me for it. I will fix bugs, but I am not taking feature requests nor helping others set it up. removed hyperlaunch key setting. Now reads it from the hyperspin settings file.